Tenant farmers are also getting benefited from the scheme indirectly as the land-owning farmers are coming forward to reduce their land lease amount. 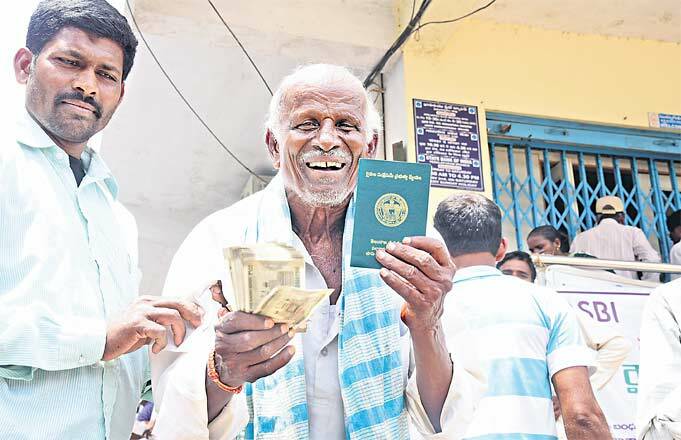 A Rythu Bandhu beneficiary is all smiles after encashing his cheque in Khammam on Friday. Hyderabad: Telangana government’s Rythu Bandhu scheme has become a model scheme for the farmers in the country and was receiving better response than the loan waiver scheme, said Municipal Administration and Urban Development Minister KT Rama Rao. He ruled out possibilities of extending the scheme to tenant farmers. “If we extend the scheme to tenant farmers, it could lead to legal problems as they will seek right on land belonging to another farmer. However, tenant farmers are also getting benefited from the scheme indirectly as the land-owning farmers are coming forward to reduce their land lease amount,” he said. In an informal interaction with mediapersons at the State Secretariat on Friday, the Minister blamed the Opposition for launching a malicious campaign against the State government and insisted that the objective of the scheme was to implement it in a smooth manner. However, the Opposition parties were busy in obstructing the novel schemes either in public or in the courts, he said. “The scheme will be implemented in more effective manner to benefit more farmers during the second spell of cultivation in November,” he assured. Opposing the claims of the Congress leaders that the Rythu Bandhu scheme was beneficial only to rich farmers and landlords, the Minister said nearly 98.3 per cent of the beneficiaries were small and marginal farmers of the State. Only 1.7 per cent of them were land-owning farmers with more than 10 acres. He rubbished the Opposition’s campaign that landlords with hundreds of acres were benefiting from the scheme, and said that no person is eligible to hold more than 54 acres as per law. “The Congress leaders want a reason to stop the scheme. If we implemented a cap on beneficiaries, they would have cried foul for not extending it to all farmers and mislead people,” he opined. He asserted that lands in possession of companies and organisations were not eligible to receive the cheques. He suggested that the Congress leaders need not bother as what farmers would do with their incentives. Rama Rao said the State government will resolve the problems pertaining to Minimum Support Price with the support from the Farmers’ Associations Coordination Committees (FACCs). “Our draft policy on Food Processing is ready and would be launched shortly to compliment the growing food production in the State,” he assured. He demanded the Central government to link National Rural Employment Guarantee Scheme (NREGS) with agriculture to benefit the farmers. He also found fault with the existing crop insurance scheme and wanted the Central government to plug the loopholes to provide compensation to farmers within five days after the crop damage.